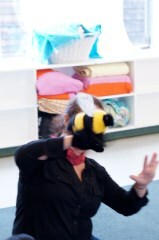 " [Teresa] ... is pleasant and very welcoming" " This class is what I had dreamt for my child, I love the instrument playing and singing as much as my daughter"
Teresa is a musically gifted teacher whose passion for music and care for children shines through. We love her class and look forward to continuing to learn further! She engages all the children and has a lot of positive energy!
" [Teresa]... makes learning music fun. Very kind and loving person!" "I look forward to coming to class every week. My son asks me to play the music ALL the time! in the car, at home ..."
T.I - mom of a 3 1/2yo. "this class is great! 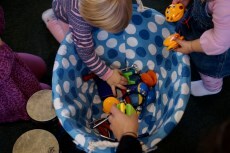 I love the 'jam sessions' at the end of the class and all the musical activities we do!" " Thank you for bringing music into our homes Teresa! we can't wait to listen to the new song collection"
[this past Music Together® semester ]was a great experience, the best one! 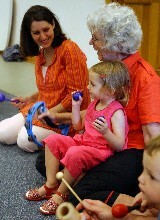 As a whole, Music Together has been a rich experience for my daughter and I. We shared the songs at home and in the car. I loved the positive energy in class and outside of the class. I can sing the songs to my baby and I always get a smile and a dance. We enjoyed the classroom experience and the continued enjoyment at home with the CD. Lots of singing & dancing. [Teresa] is very fun and kind. She made a lot out of each child. A very overall positive experience. I could see a definite increase in participation level of my son, who has previously been shy and timid around other children. It has been a wonderful experience for both of us to share together! He loves it when I sing the songs to him from class. Maddie and I are excited to get back into Music Together. She's quite the musical being- we still play the songs around the house and in the car. 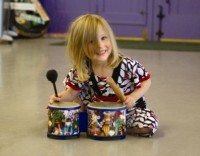 She's always tapping and swaying her hips to the beat- she even drums on the couch and tries to play with instruments in her playroom. I think Maddie really took to the classes!